VENTS access doors are now available in two new sizes: D 250*250 and D2 300*300. Access doors help conceal ventilation or plumbing equipment, ducting and piping and improve the visual appeal of the interior. Being suitable for wall and ceiling installation the units are also water-resistant which makes them perfect for spaces with elevated humidity. 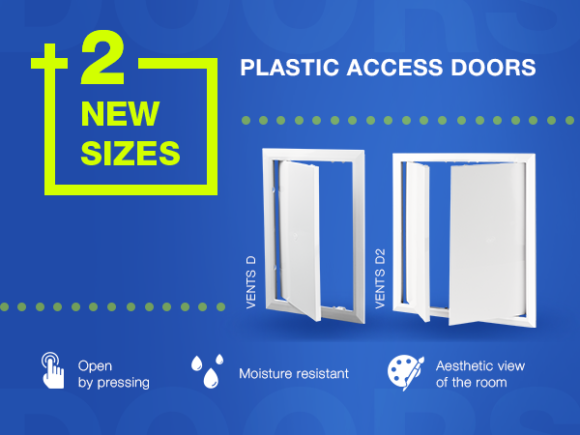 The new sizes of access doors make the selection much easier than before, and their inconspicuous square shape and minimalist design would complement a wide range of bathrooms, toilets and other accommodation spaces.